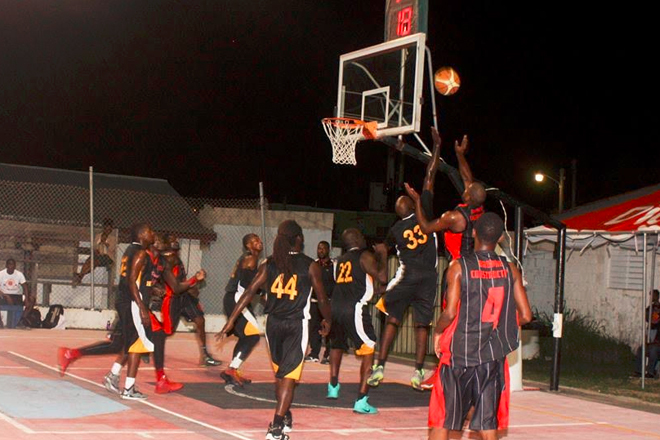 (SKNABA) — Basketball City was full of excitement on Thursday Evening as the long anticipated 2016 Bigger, Better and More Exciting SKNABA National Bank Premier Division Finals tipped off . Both teams got off to a slow start with Hitters failing to score in the first 4 minutes of the game and St.Pauls scoring just two baskets. The drought at the start of the game forced Coach Barman Hanley of Hitters to call a very early timeout to inspire his team to shake out what was obviously some opening game Jitters. The timeout worked and Hitters got in the groove and began to make the game a bit more competitive. However led by the dominant interior play of Noshorn Maynard and Noren Maynard the St.Pauls team raced to a 44-31 lead by halftime. The Tuff Knots maintained their lead for entire remainder of the game and was able to weather a later 4th quarter surge by Hitters led by the exciting Levi By-By Fyfield who unleashed a series of three pointers to give his team some semblance of hope. But the Tuff Knots in the end were simply too tough for the Hitters. The Final Score saw the defending champions Tuff Knots beginning the series exactly where they left it last year and that is with an impressive victory. The final Score was 71-60. Nashorn Maynard – 16 pts, 14 rebs and 4 assists. Game 2 takes place this Sunday September 11th at 8pm at Basketball City .